Although the word utopia and eutopia sound the same, they have different meanings i.e. they are examples of homophones. The word utopia comes from the Greek word ou-topos which translates to ‘no place’ or ‘nowhere’ according to the British Library website. According to Wikipedia, the Greek translation for eu is “good” or “well” therefore eutopia means “good place”. As you can imagine, this causes confusion and thus brings about the double meaning. 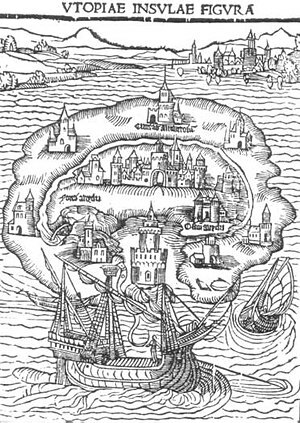 Wikipedia explains that Sir Thomas Moore was the first to use the word utopia 1516 in his book Utopia. It was written in Latin and had a very long name which roughly translates to “A Truly Golden Little Book” which is about “a fictional island in the Atlantic Ocean”. Sounds magical! …and the synonyms are anti-utopia, dystopia and hell!